Here’s something for the SME Businesses in Victoria. 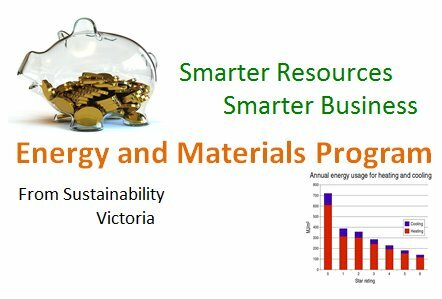 Sustainability Victoria have their Smarter Resources Smarter Business program now available which provides funding assistance for eligible businesses to become more competitive and productive through resource efficiency. The program assists businesses by funding up to 50% of the cost of an energy assessment, and up to 75% for materials assessments. There are other benefits as well such as the implementation bonus and assistance with implementing the recommended changes. We are working with Sustainability Victoria to promote this program, support businesses through the process and by conducting of the required Level 2 Energy Audit assessments. If you’d like to know more see our web information page by clicking here. It’s a great opportunity that’s currently scheduled to run until 2015, but we all know that could change at any time so get in touch if you’re interested. We can explain the process, work with you from start to finish and support you in becoming more competitive and productive through resource efficiency. There’s never been a better time to get your business into shape for the future, and right now, if you’re an eligible business, you can get funding assistance for it! I expect any switched on (or is that ‘smart’) business would be onto this pretty quickly to maximise the funding opportunities available to minimise operational costs. So click here if you’d like to know more.